Underhanded and manipulative, the Scorpion Clan are often seen as the villain in the land of the Emerald Empire. And often, with good reason. After all, to best combat the liars, thieves, and traitors within the Great Clans, the Scorpion lie, steal, and cheat in turn. The weapons of the Scorpion have become blackmail, poison, and sabotage, their agents unafraid to dirty their hands to keep the Empire clean. 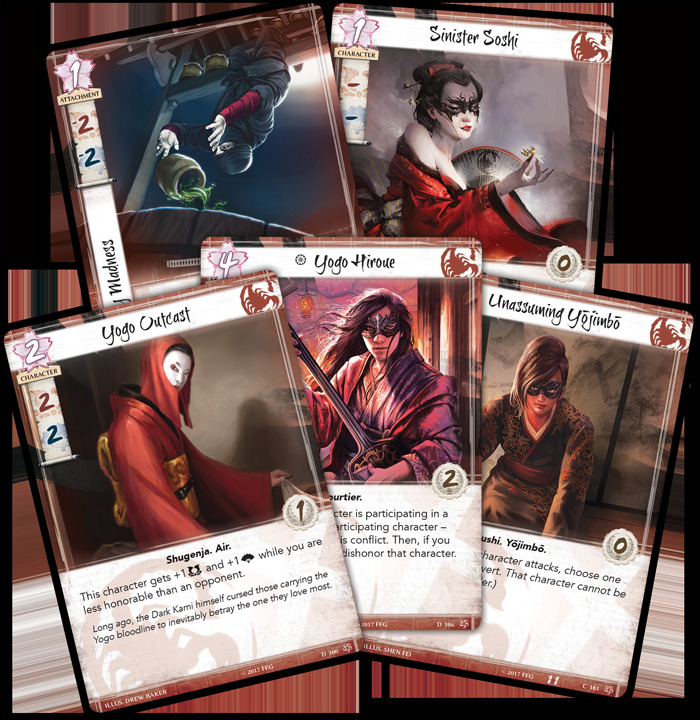 Today we’re previewing the secretive Scorpion Clan in Legend of the Five Rings: The Card Game. 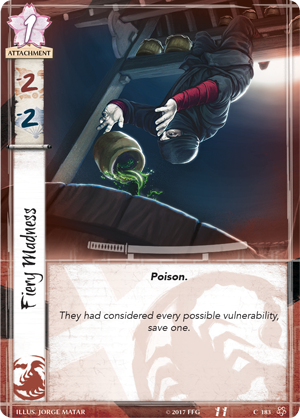 With potent tricks and traps, the Scorpion Clan devastate their foes with powerful conflict cards and deceptive tactics. The Scorpion best those who oppose them not through physical might, but through shame and sabotage. 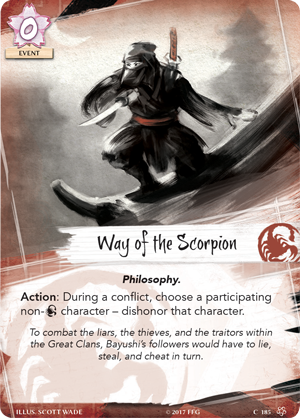 This is exemplified by Way of the Scorpion (Core Set, 185), a card that doesn’t provide a bonus to you, but instead dishonors an opponent’s non-Scorpion character during a conflict, potentially lowering their skills and forcing your opponent to lose an honor when that character leaves the field. 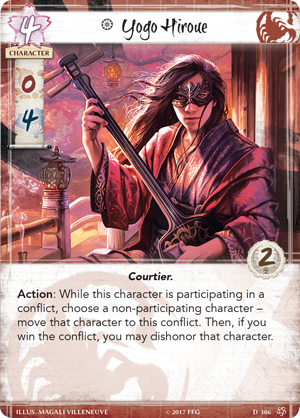 Yogo Hiroue (Core Set, 106) already excels in winning political conflicts with four political skill, but as an action can also bring a character into a conflict he is participating in and dishonor them if you win the conflict. Not only does this force a character into a conflict they may not be optimal in, the additional dishonor ensures they are left in a poor state, and bowed at that. The Scorpion have more ways than dishonor to devastate an opponent’s skills. Inflicting characters with a Fiery Madness (Core Set, 183) attachment gives them minus two military and political skill at the cost of one fate, taking a toll on even the most hardened warriors. Even without lowering your opponent’s skills, the Scorpion are masters of manipulation. 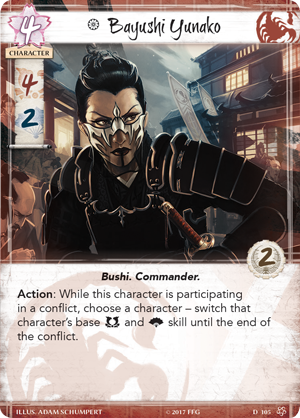 Bayushi Yunako (Core Set, 105) is a four-cost character with four military and two political skill. During a conflict, she is participating in, Yunako can switch the base military and political skills of a character until the end of the conflict. 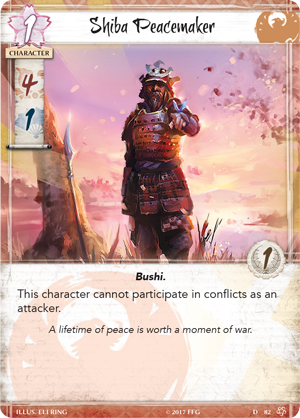 This can severely lower the impact of characters in conflict— Shiba Peacemaker (Core Set, 82) participating in a military conflict may find himself suddenly near useless. But the ability can also be used to your benefit, even turning Yunako herself into a character with four political skill. Shosuro Miyako is a Shinobi with three military and two political skill. 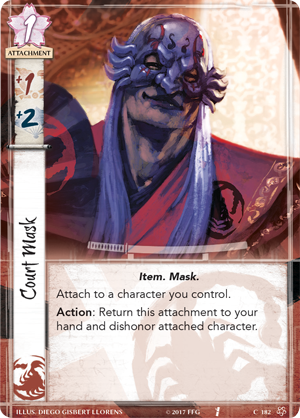 As a Reaction, any time you play character from your hand, your opponent must either discard a random card from their hand or dishonor a character they control. 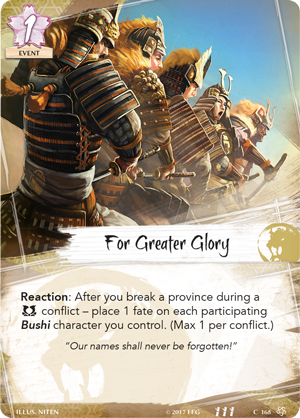 Both play into the Scorpion’s strategy by either dishonoring a character or pushing higher honor bids as your opponent is forced to discard more and more options. 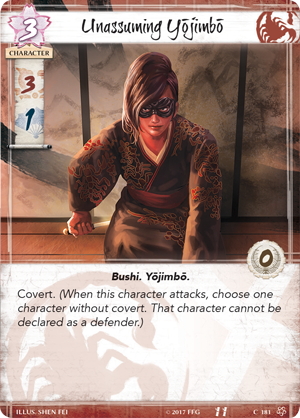 Playing an Unassuming Yojimbo (Core Set, 181) with Shosuro Miyako on the field is a powerful move, and can swing the conflict momentum greatly in your favor. The Scorpion’s dishonor theme extends to themselves, playing the role of the villain for the good of the Emerald Empire. 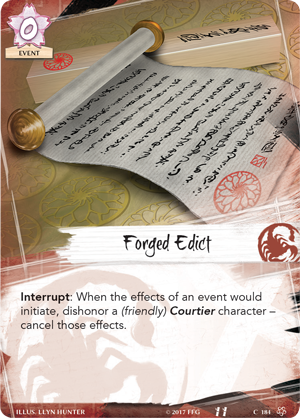 Forged Edict (Core Set, 184) allows a player to cancel the effects of an event, provided they dishonor a friendly Courtier character. While this may seem like a steep cost, the ability to stop powerful events like For Greater Glory (Core Set, 168) in their tracks is a massive benefit. Attaching one of your characters with a Court Mask (Core Set, 182) gives them an additional military skill and two political skill. The mask can be brought back to your hand as an action, but the attached character becomes dishonored. Using this action when the attached character has no fate left can be a powerful move, as you retrieve a powerful attachment that would otherwise be lost, with only the cost of one honor. Of course, an honored or dishonored status can be removed with the Soshi Illusionist (Core Set, 99), a two cost Shugenja with one military skill and three political skill. As an action, he can remove harmful dishonored tokens on your friendly characters, or an honored status token of a foe for the cost of one fate. This can ensure your character’s stats are not affected negatively when using cards like Forged Edict. As can be seen, the Scorpion excel at honor manipulation, often sinking their own honor to bring down their opponent. 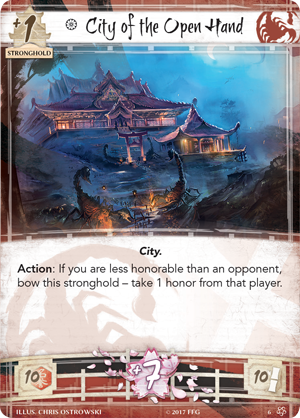 Though their Stronghold, City of the Open Hand (Core Set, 6), starts the Scorpion off with only ten honor, its ability allows you to bow it if you are less honorable than an opponent and take one honor from that player. This can offset the high honor bids the Scorpion Clan will often employ while also inching your opponent closer to losing all their honor. 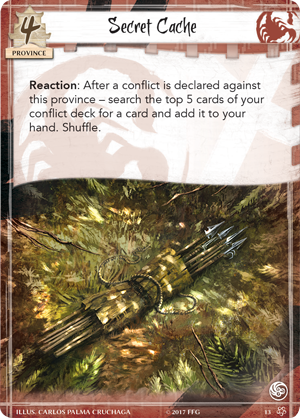 The Scorpion Clan’s unique province, Secret Cache (Core Set, 13), allows the Scorpion to search the top five cards of their conflict deck for a card to add to their hand whenever a conflict is declared there. This can ensure the Scorpion always have the tools they need to defend their lands by gaining cards without losing any honor. 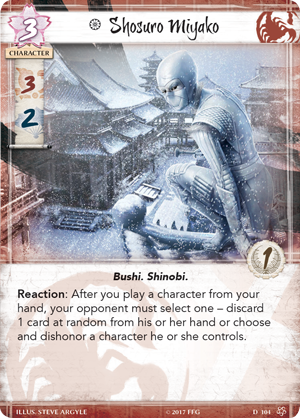 Of all the Clan Champions, few have the foresight of Bayushi Shoju (Core Set, 107). Contemplative and wise, Shoju studies the Emerald Empire through a macro-lens, and understands the subtle machinations needed to not only keep the Empire in balance, but the Scorpion in favor. 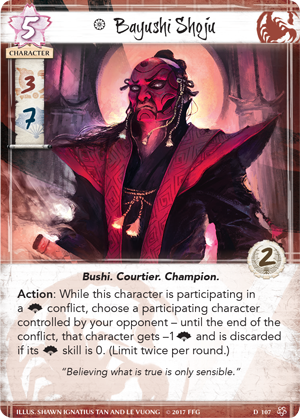 Shoju enters Legend of the Five Rings: The Card Game with three military skill, seven political skill, and two glory. While Shoju already has a massive advantage in political conflicts, his ability makes him an even bigger threat. Twice per round as an action during a political conflict he is participating in, Shoju can choose a character controlled by an opponent and lower their political skill by one until the end of that conflict, discarding that character if their political skill reaches zero. 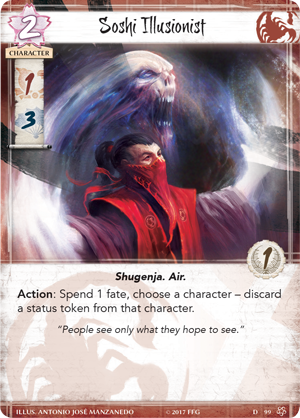 This forces your opponent to always be wary when sending characters to political conflicts, as Shoju can easily discard a character that has two or lower political skill. When you consider all the other ways Scorpion have of lowering skills, virtually no character is safe from the threat of Bayushi Shoju. Through deception and sabotage, the Scorpion have secured themselves as one of the most powerful Clans in Rokugan. Will you put on the mask and become the villain the Empire needs? 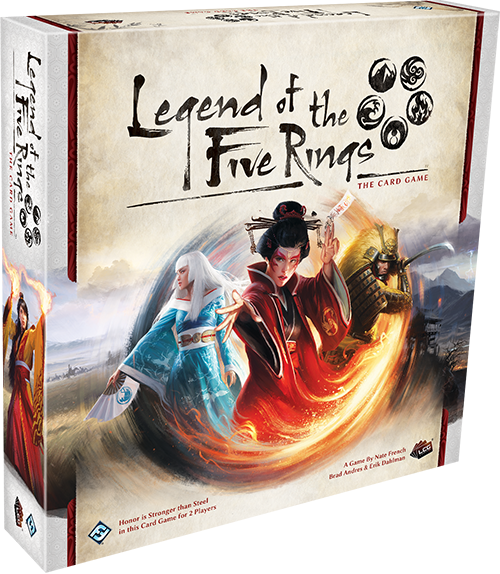 Become the villain and purchase Legend of the Five Rings: The Card Game (L5C01) at Gen Con 2017 or from your local retailer in the fourth quarter of 2017!